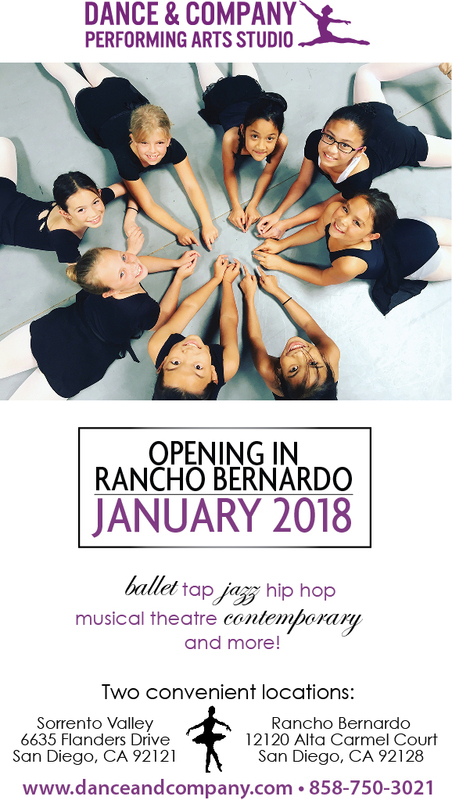 We are so excited to join the wonderful community of Rancho Bernardo. We are on track to open for our first day of classes on Tuesday, January 2nd and we can’t wait to meet you! We had a blast meeting so many new faces during our soft opening week and look forward to having you all in class in the new year. Please email inquiries@danceandcompany.net to get in contact with our management team regarding which classes are best suited for you. We advise checking the schedule prior to attending class as we have made some revisions since our open house, but please do not hesitate to email us with questions. If you don’t see a class that works with your schedule/level, please email us at inquiries@danceandcompany.net — We want to hear from you! You can view our Online store here for the dancewear and shoes that we sell, but note that we also have a wide variety of personalized Dance & Company apparel available at the studio.